The 2013 Coachella Valley Wildflower Festival is coming up on Saturday, March 2 in Palm Desert, California. It's a great FREE family event with guided hikes, specialty workshops, activities for kids, live music, food, a beer and wine garden, and artists. 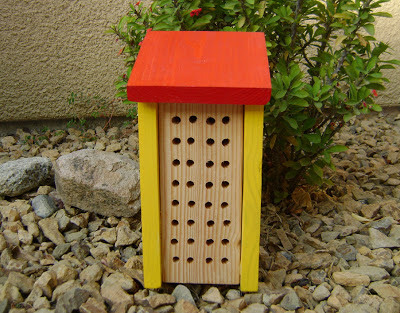 Once again Barefoot Swan Nature Arts will have a booth where we will be selling our handmade and one-of-a-kind Bird Houses, Bee Houses and Bird Feeders. 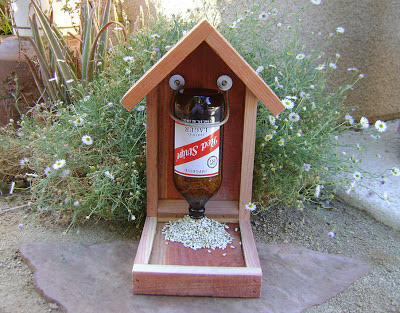 We'll have our best-selling Beer and Wine Bottle Bird Feeders available. Some new labels have been added to the selection. Our colorful new Bee Houses for solitary bees will also be available for purchase. 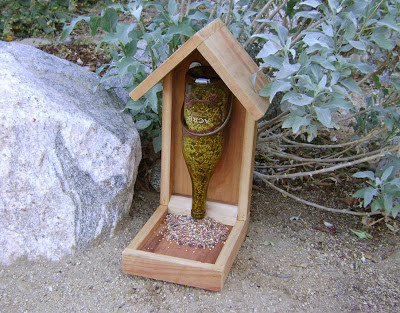 They are available in Sky Blue, Sage Green, Rust/Brown and Yellow/Red. Free Parking at St. Margaret's Church (47-535 Highway 74), with free shuttle to the event. The Santa Rosa and San Jacinto Mountains National Monument Visitor Center is located on Highway 74, just south of Palm Desert CA. We brought our telescope to 2 Star Parties this past weekend. The first was sponsored by a local elementary school, and was attended by the students and their families. Our scope was one of four set up that evening. Many of the people there had never looked through an astronomical telescope before. The second Star Party was a regularly scheduled event at the Santa Rosa and San Jacinto Mountains National Monument Visitor Center, in Palm Desert. The Moon was prominent in the sky during both events. Normally, we'd rather observe the night sky without the Moon's bright light washing out the fainter objects. But it is a popular object for viewing. We had good looks at Jupiter and its Galilean moons, the Orion Nebula and other objects. We all enjoyed watching a reall-l-l-l-y long flyover by the Hubble Space Telescope, at the Visitor Center star party. 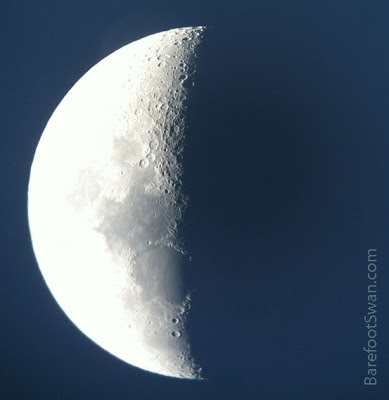 This picture of the Moon was taken with my SmartPhone camera, held to the eyepiece of our telescope. Not exactly rocket science, but the image turned out better than I thought it would. "The true joy of a moonlit night is something we no longer understand. Only the men of old, when there were no lights, could understand the joy of a moonlit night." It's the first weekend in February. The first flowers of the season on our Nectarine tree. 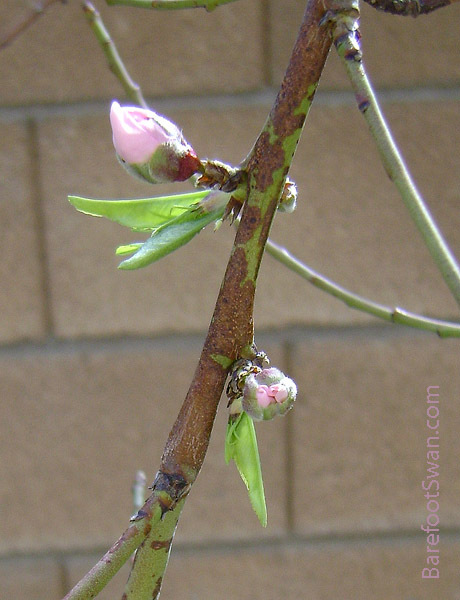 Lots of new buds on the Apricot tree. 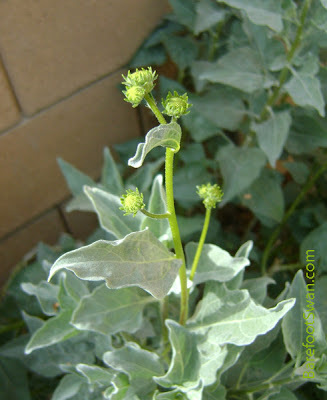 Encelia bushes are getting ready to flower. Two weeks ago we were having highs in the 50's, and overnight temperatures low enough to freeze the water in the bird bath. Now we're enjoying pleasant days in the 70's. "And so ye faithful, there is no shadow to see. 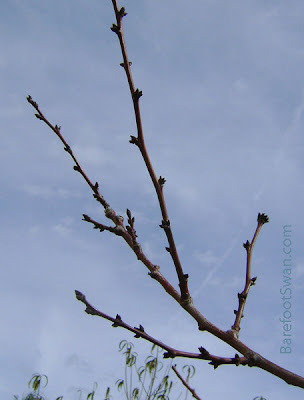 An early spring for you and me."